She became a global action star after starring in Lara Croft: Tomb Raider and Tomb Raider: The Cradle Of Life. 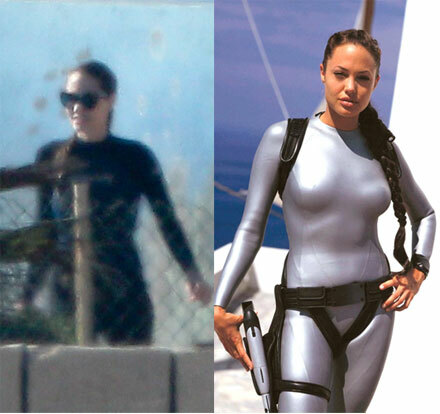 Eight years after the final installment of the comic book-based thriller Angelina Jolie is back in a wetsuit, this time to play with dolphins and spend a day at a marine park with her six kids. Unlike her partner Brad Pitt who bared his muscles chest during the day in the park Angelina preferred to cover up in the black wetsuit. Can’t say her body looks as impressive, toned and strong as eight years ago but she still looks quite nice for a full-time working mother of six, actress, director and hands-on UN Goodwill Ambassador. The whole family of eight is now in Malta where Brad Pitt is busy filming his new movie, the post-apocalyptic horror World War Z.
Angelina is enjoying a short break in her hectic schedule to spend some time with her children and then get back to her acting duties as Cleopatra as her new project is now in early stages of production. Starving: 50 Cent lost 64 pounds for new movie!